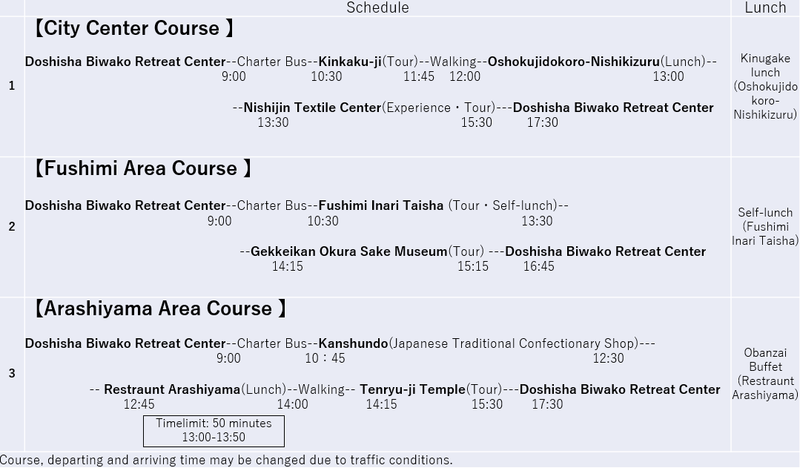 You will choose one of the following three courses ( Kyoto City course, Hushimi course, Arashiyama course ) and do it on the fourth day (August 28). The course is decided by taking questionnaire in advance. WSEN members will guide each course. The greatest feature of this course is Kinkaku-ji, which is a tourist site representing Kyoto.The official name of Kinkaku-ji is Rokuon-ji. 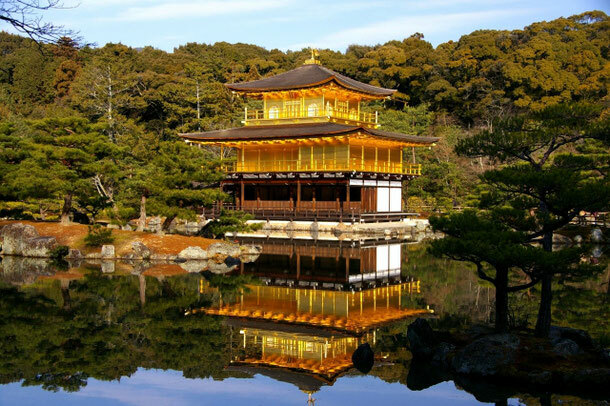 Rokuon-ji has the most famous building called Kinkaku, which is covered by gold. Gold is telled "kin" in Japan . So that is why it’s called Kinkaku-ji. Kinkaku is known not only for its appearance, but also for its three-layers structure. These layers built in different styles. You can also appear the building in the pond and spring. The point of the view always attracts many people. 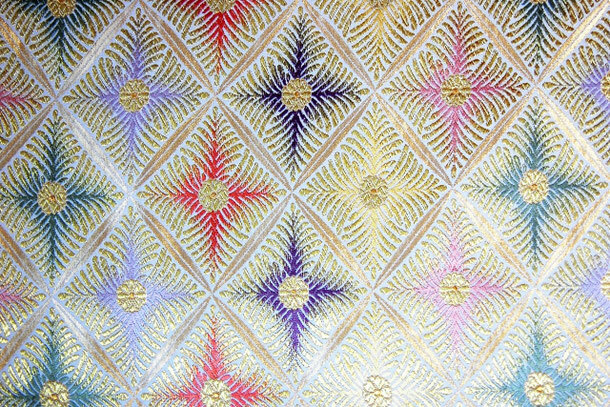 Nishijin textile is expensive silk fabric which made in Kyoto. You can hand-woven actually in Nishijin Textile Center. You can make a table center while receiving advice from staff. You bring back it.You can also learn about Nishijin textile and see the kimono show. Kimono is used as a formal wear, and important in Japanese traditional culture, for example, Sado(chano-Yu) , Kado(ikebana) and so on. In Oshokujidokoro Nishikizuru, You can eat Tofu, one of famous meals in Kyoto. 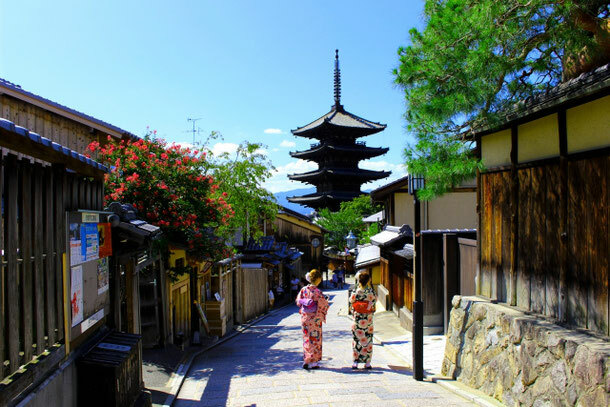 Let’s go around Kyoto City, and you can feel its long history. 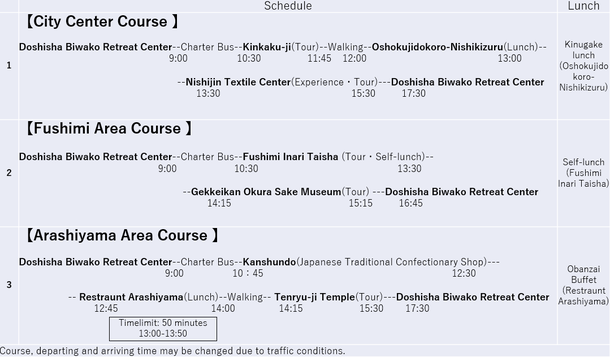 In this tour, you can visit Yatuhashian Kakehashi, Gekkeikan Okura Sake museum and Fushimi Inari Taisha. 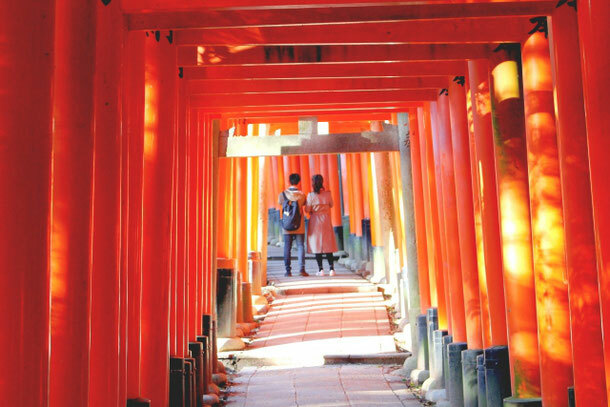 Especially, Fushimi Inari Taisha is main tourist spot of this course and is very popular among visitor from different countries. Yatuhashian Kakehashi , Kyoto`s traditional foods, is offered by buffets. At Gekkeikan Okura Sake museum, rice wine museum, you can see old tools using to make sake.The end of the tour, you can get the souvenirs.Gekkeikan is sake that is widely known during Japanese. Fushimi Inari Taisha is most famous shrine in Japan.You can see spectacular views. There are so many shrine archways. When you visit popular tourist in Kyoto, you may know why Kyoto is loved by people around the world. Arashiyama is one of the main sightseeing spots in Kyoto. 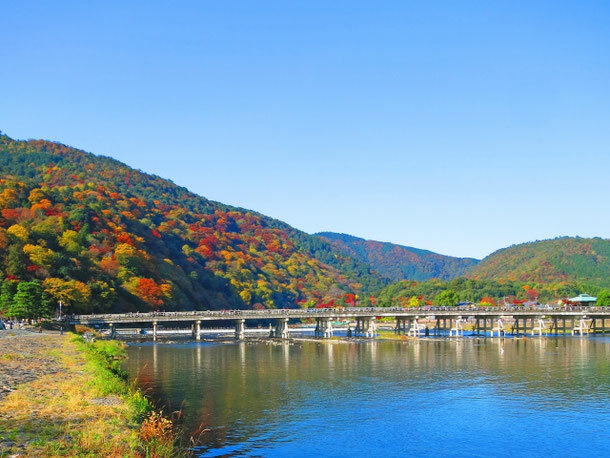 Tourists are attracted to Arashiyama ,where you can enjoy the beautiful scenery of each season. Including the World Cultural Heritage Tenryu-ji, being scattered many historical temples, is also one of the good points of Arashiyama.Tenryu-ji has a beautiful garden called Sogenchi Teien , which is borrowed landscape of Arashiyama and Kameyama. Also,you can see and enjoy the unique architecture and Japanese art works in the main hall of this temple. For lunch, you can enjoy Obanzai, which is synonymous with traditional Kyoto dishes with buffet style. Moreover,in Kanshundo, you can experience how to make Kyogashi(traditional Japanese sweets). Kiyohashi is world-class sweets that Japan can be proud of. Please enjoy Japanese culture in Arashiyama where is deeply related to Japanese tradition and history!! !